The Darmstadt Jazz Conceptions, founded in 1992, have become a major German jazz workshop. The workshop’s success is based both on its concept and its unique atmosphere. Instead of masterclasses the students work in ensembles from the start and rehearse pieces chosen by the respective teacher (or composed or improvised during the week). They learn the secrets of improvisation, the planning of musical processes and arrangements, and thus the philosophy of jazz and improvised music. The workshop takes place at Bessunger Knabenschule, a former boys’ school which has been transformed into a socio-cultural center and which, for one week each year, becomes a home for jazz. During this week the music fills each room, and in between the students meet in the courtyard for breakfast or to share lunch cooked on the premises, and to chat about their experiences or plans for further musical activities. Conditions and application form (only in German) hier entlang bitte! What are the Jazz Conceptions? The Darmstadt Jazz Conceptions workshop is a unique opportunity to work with professional musicians and to discover some of the secrets about the making of jazz. During the ensemble sessions the musicians rehearse pieces, learn about how to practise correctly, discuss the finer points of harmony, rehearse and analyze solo or group improvisation. In the late afternoons, an orchestra workshop brings most of the students together for an unusual orchestra of up to 40 instruments. Between ensemble sessions there is plenty of opportunity for individual practice with other students, or for relaxed conversation in the Jazz Conceptions’ cafeteria. Also on the agenda are also a number of theoretical or jazz-historical items (the latter in combination with an obligatory visit to the Darmstadt Jazzinstitut). Every evening, at one of the many Darmstadt clubs, students can show the results of their day’s work to an audience or just jam. The Darmstadt Jazz Conceptions are popular not only with the participants, many of whom have been coming back for years, but also with the teachers who appreciate the creative atmosphere which fills the Bessunger Knabenschule with jazzy music for six days. At the 28th Jazz Conceptions once again we plan to invite some excellent teachers, each of whom has developed his or her own concept as a soloist or in a group, individually or collectively. For participation in the Jazz Conceptions it is not necessary to speak perfect German, but you should have basic skills of the language. The registration formalities (below) are in German. If you need any assistance to understand, please don’t hesitate to call or email us. 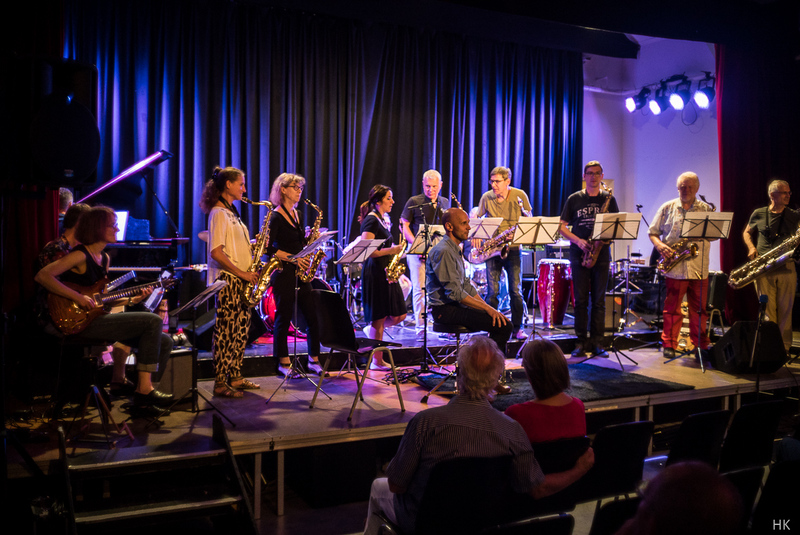 The Jazz Conceptions are a joint project organized by the cultural center Bessunger Knabenschule and the municipal Jazzinstituts Darmstadt.